Gainax is dead, long live Gainax! 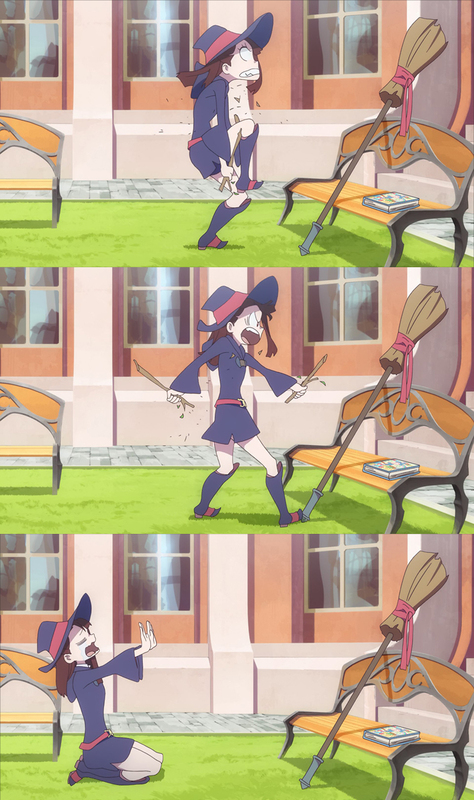 The witch of baseless optimism Akko signs up for a broom relay race despite being incapable of flying, as she chases her idol Shiny Chariot’s achievements. Hijinks of the magical kind ensue. I have to admit that episodes like this make focusing on my job much easier, since we don’t even have to pretend the summary matters at all. 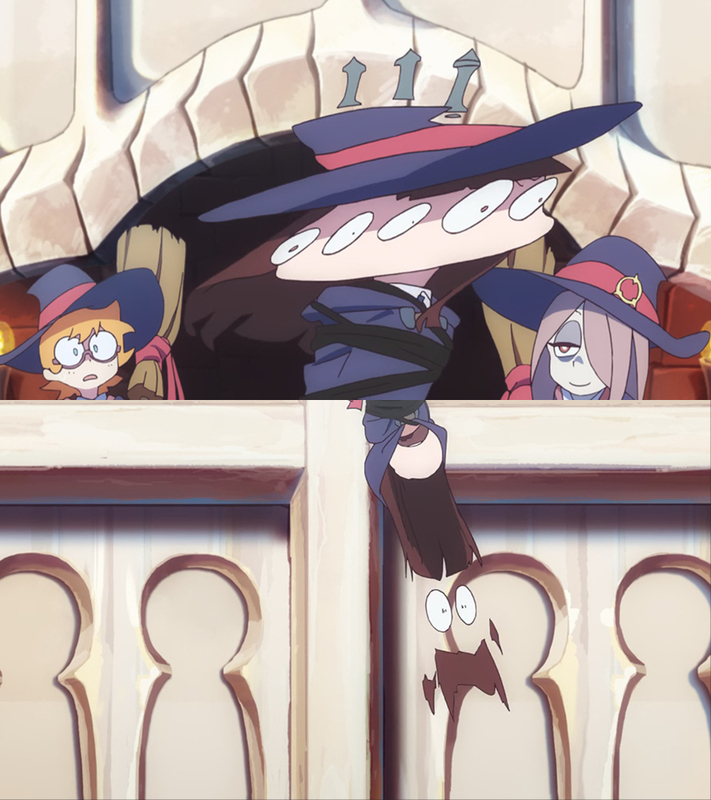 This isn’t to say that it wasn’t a thoughtfully crafted episode of course – quite the opposite in fact, since I can confidently say that was the best storyboard Little Witch Academia has ever had as its skeleton. 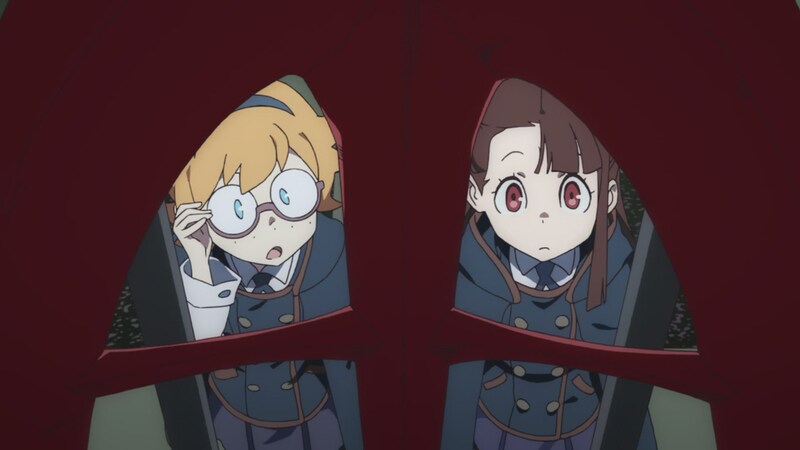 The reason is clear: for the first time we experienced LWA boarded by someone other than Yoshinari himself, and it happened to be an artist capable of putting his genius to shame. Let’s talk about Masayuki a bit. 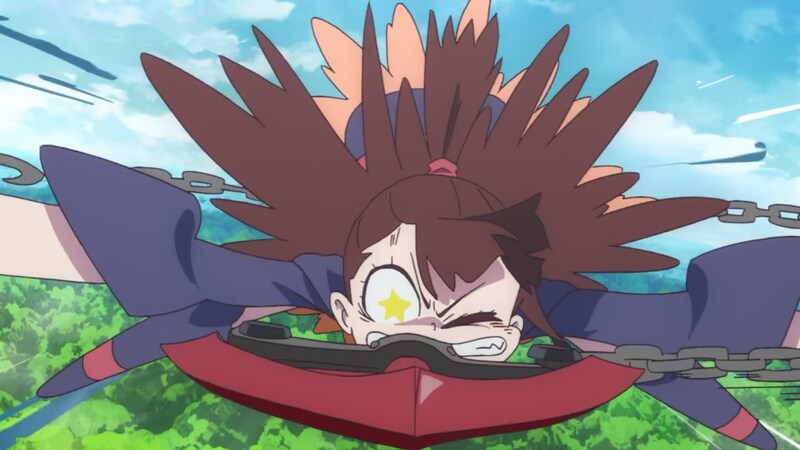 If you ask any anime fan relatively acquainted with the industry where did Gainax’s talent go, chances are they will say Trigger. 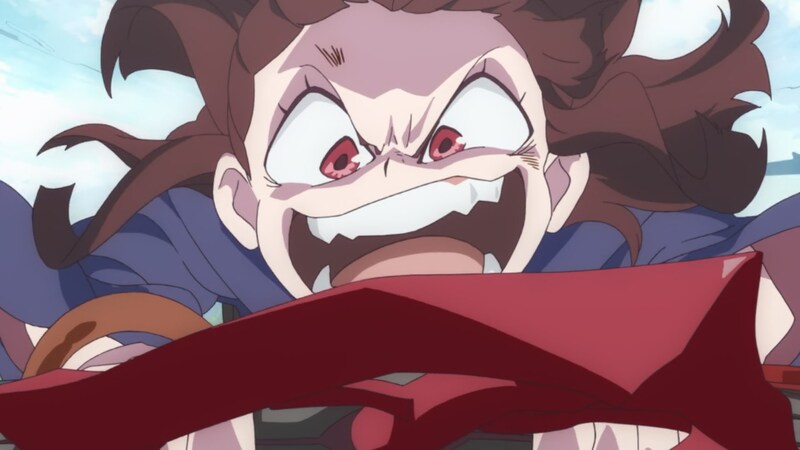 Which is a fair assessment, if the first thing you think about when they name the studio is Gurren Lagann; Imaishi’s GEEKS crew and animation aces like Yoshinari himself have ended up at Trigger either as full-time members or tightly linked freelancers. But if the Gainax era you treasure the most is a bit older, then you have to look elsewhere. Sadly, if anyone replied Khara to that earlier question, they would quickly follow it up with that’s where Hideaki Anno went. And as much as I adore Anno as a creator, his figure as the living brand image of a creative team that obscures everyone else in it is frankly sad. Some of them are relatively lucky, like Kazuya Tsurumaki whose work as FLCL’s director still granted him some widespread recognition. Things get more complicated with Mahiro Maeda, whose fascinating Gankutsuou is a bit too niche to allow him similar fame. And then we’ve got Masayuki – real name Masayuki Yamaguchi (山口正幸), always credited as Masayuki (摩砂雪). Regular asset in Nadia, assistant series director and just about every role on Evangelion TV, co-storyboarder in End of Evangelion, and director in all of Rebuild. Even storyboarding, direction and photography duties in Shin Godzilla recently! Right about everything Anno is (rightfully) acclaimed for had Masayuki as a fundamental piece, and yet barely anyone is aware of him; the shadow his colleague casts is so dark it has swallowed many excellent creators, which is unfortunate because Khara employs more outstanding directors than any studio other than perhaps some Kyoto fellows…even if they don’t get to actually do any work, with Rebuild being eternally trapped in limbo. Simply lamenting unsung heroes would be a bit of a sad post though, so let’s move onto the actually joyful episode. Right off the bat there’s more nuance than before, as seen on the early shot emphasizing the gap between the idol and the blissfully unaware admirer. 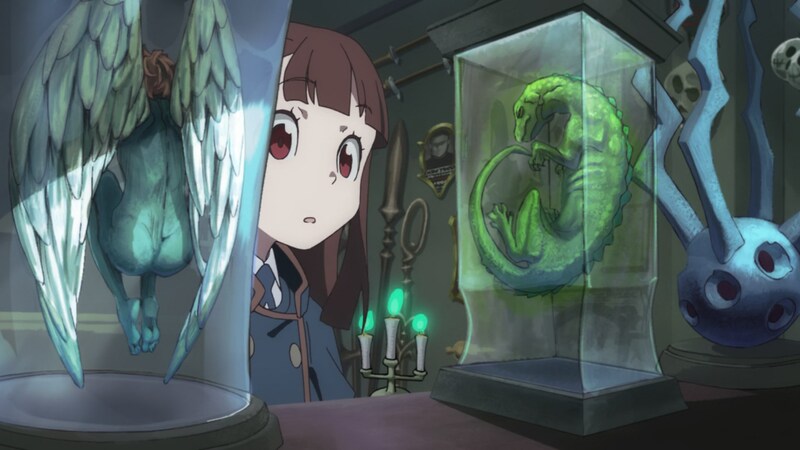 But subtlety – if you can even call it that – isn’t really Little Witch Academia’s game, and he instead focused on giving the episode impeccable flow; I get the feeling most viewers will realize something just feels right while not being able to pinpoint exactly what it is. Some transitions stand out as particularly inspired, but for the most part he achieves this through great understanding of progression, giving the episode a beautiful kind of silent excellence. The way he constructs scenes is exquisite in general, which means the layouts also leveled up this time around; he’ll quickly make a creepy shop feel equal parts inviting and unsettling, and his fondness of framing events from within leads to many neat shots that even highlight contrasting attitudes. As much as I’m praising the episode however, I doubt we’ll see Masayuki work on the series regularly, and I’m not convinced it would be a good thing either way; he barely boards TV anime anymore, which is fairly evident when you look at his outright refusal to take production shortcuts. He frames scenes in complex manner, constantly focusing on the movement rather than shying away from it. It’s particularly obvious in the second half of the episode, which is full of background animation cuts meant to evoke the sense of speed that bit by bit accumulate into a quite ridiculous animation workload. Hiroshi Kobayashi’s striking sense elevated Kiznaiver, but I firmly believe Masayuki crafted the best storyboard attached to a Trigger production. And yet, having him stay away from the project could be positive for its health. Production matters are complicated! 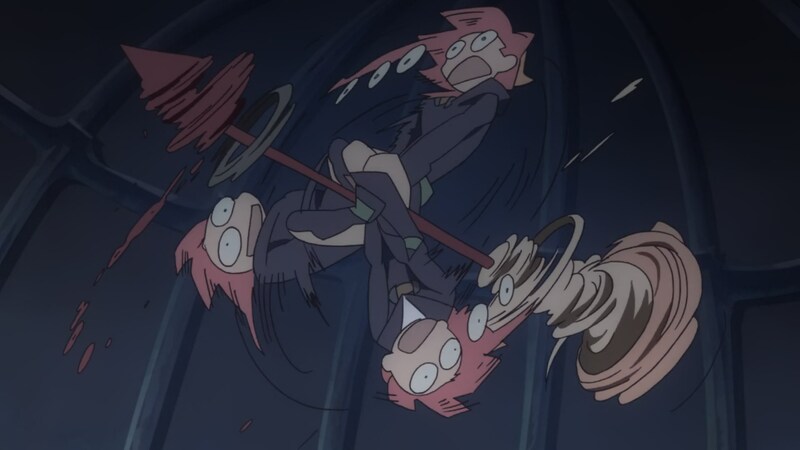 Since we’re already talking about the animation, this feels like the right time to move onto the other important figure in this episode. 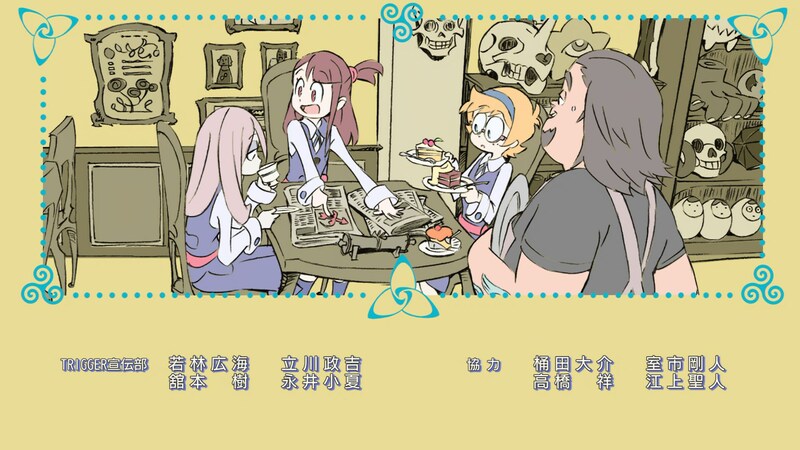 LWA #3 marked the animation direction debut for Kai Ikarashi, one of Trigger’s most interesting young artists. As an illustrator he has a late 80s~90s style embracing western aesthetics, and his animation timing is blatantly Kanada-like but with personal flair when it comes to the poses. It’s still very early, but he’s shaping up to be a more interesting successor to Hiroyuki Imaishi than the seemingly appointed one Akira Amemiya. 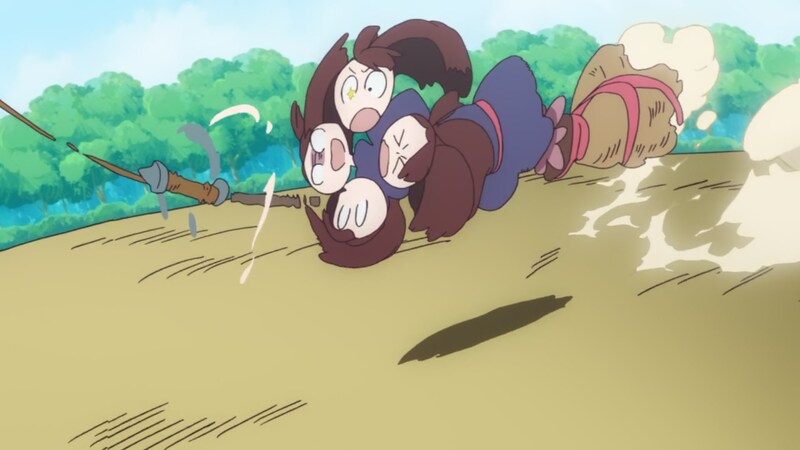 I was curious about how he would fare with these supervision duties, and the result was satisfactory to say the least – I would even call it the best animation direction work in LWA TV! Thanks to his corrections the drawings are more expressive than ever, with sequences that work solely because of the lively expressions and movement; there’s plenty of those, occurring even in the background. And while it’s not quite his field, the mob characters were also a more amusing crowd this time around. This had been a bit of a disappointment so far, and it’s not quite at the level where I’d want it to be, but we’re finally seeing some more weird creatures here and there. I definitely appreciate the racial diversity amongst the students because it truly makes the school feel like an institution that attracts people from all around the world, like the adorable race commentator from Kenya. The student designs are understandably restrained however, so I’d like to see way more of the outlandish, wacky magical side of this world. And maybe some more amusing cameos, why not. When it comes to impressive cuts, this episode is easily the strongest one yet as well. There’s a plethora of movement, to the joy of us fans but perhaps not so much for the production team. A veritable truckload of freelancer animators were needed to finish the episode, but also a bunch of Trigger’s highest regarded artists. 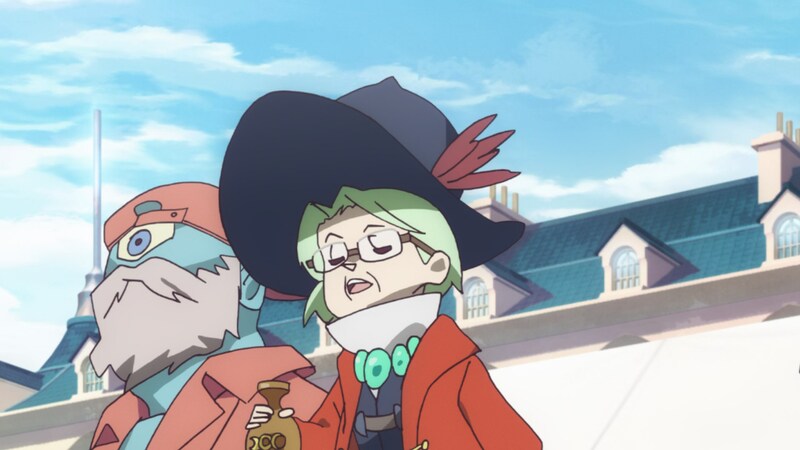 Hiroyuki Imaishi is leaving the project altogether, leaving behind an upcoming storyboard and these 3 stylish, block shaded cuts; his animation feels particularly appropriate for an embellished legend being told many years later. 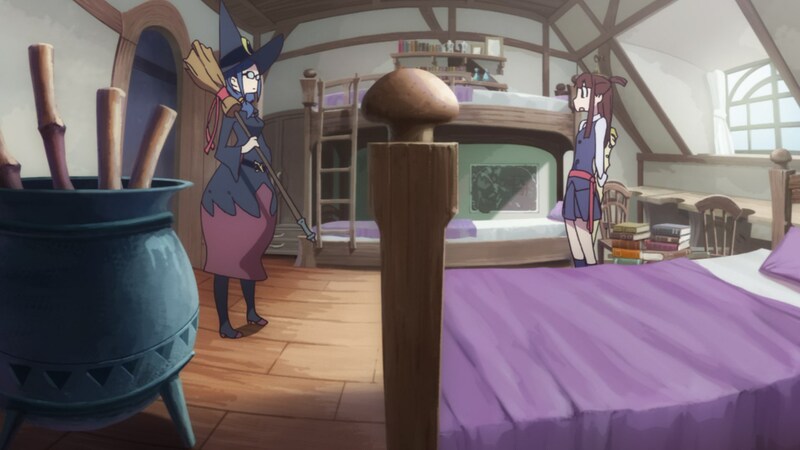 I get the feeling sushio animated the scene with Akko fighting over control of the broom, since the smears feel like his work and her expression could be straight out of Kill la Kill. Even Yusuke Yoshigaki was around to help as assistant supervisor and with some new, appropriate illustration for the ending – something that might happen every week? 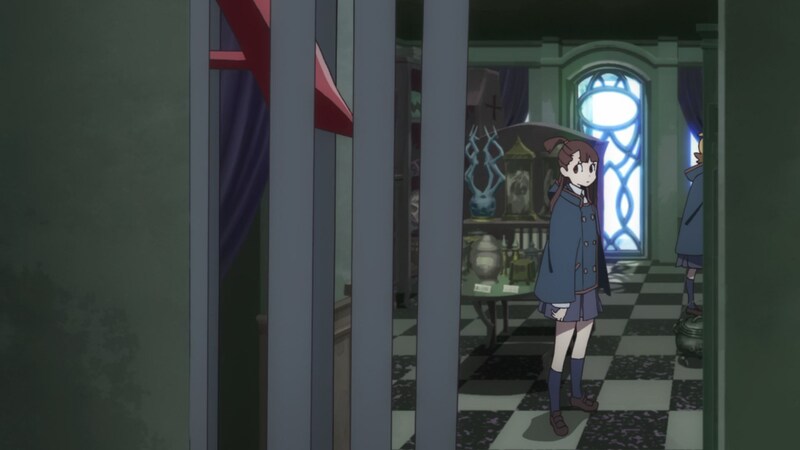 If we look beyond the studio’s usual names we find people like the webgen ace Takahito Sakazume, who animated part of Akko’s ridiculous world tour on the broom. 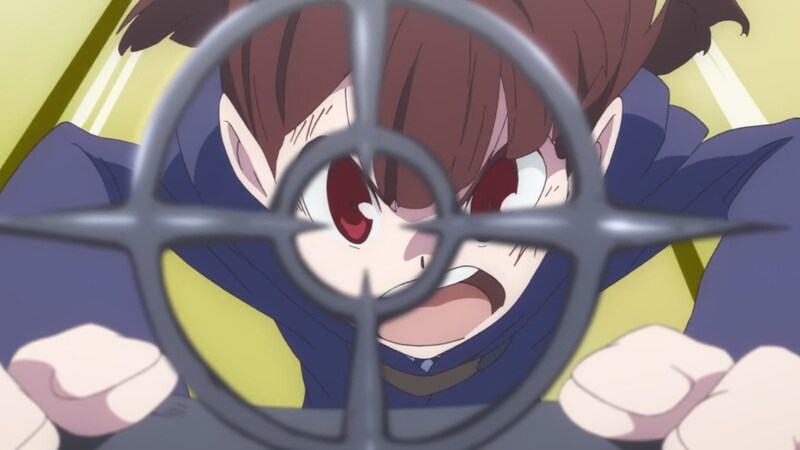 He confirmed Yoshinari personally corrected some of it, which doesn’t come as much of a surprise; I’m not sure how often he can afford to do uncredited corrections, but perhaps Sakazume’s work was specifically corrected because his blatantly digital output is at odds with the show’s general aesthetic. It’s also worth noting that Yuki “aninabe” Watanabe, whom I’d been wishing to show up, made his appearance – perhaps in this scene with many eye multiples that he likes so much. Hopefully he’ll eventually return as animation director, since he’s very compatible with this material. 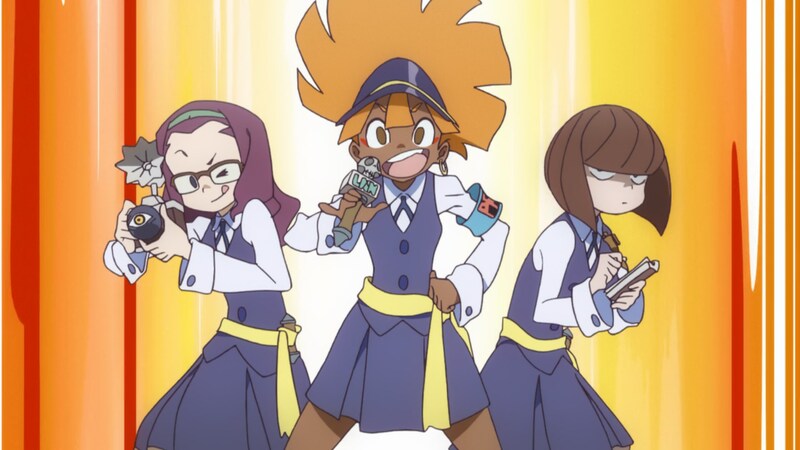 But who are Imaishi’s GEEKs? Couldn’t find anything online about it. The GEEKS (or GEEK FLEET and GEEK BOAT, depending on the situation) are a collective that showcases as a proper unitary entity (even as copyright holder) the creative work input of a group composed by the aforementioned Mr. Wakabayashi and P&SwG originals Hiroyuki Imaishi, GORIPON, Shigeto Koyama and Otonari (Sushio too? I think he was credited as independent on the first CEMETERY HILLS books, isn’t it?). 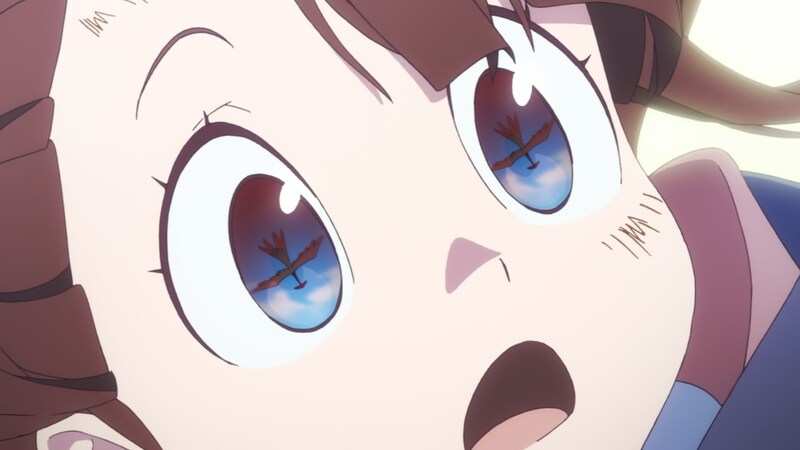 I wish we got another season of Animator Expo, not only because the project owns but also because I’d love to see Masayuki actually direct a short film for that series. Casette Girl is neat but give some something he has full creative control over! Maybe if he made something ridiculously cool a few more people would notice his existence. 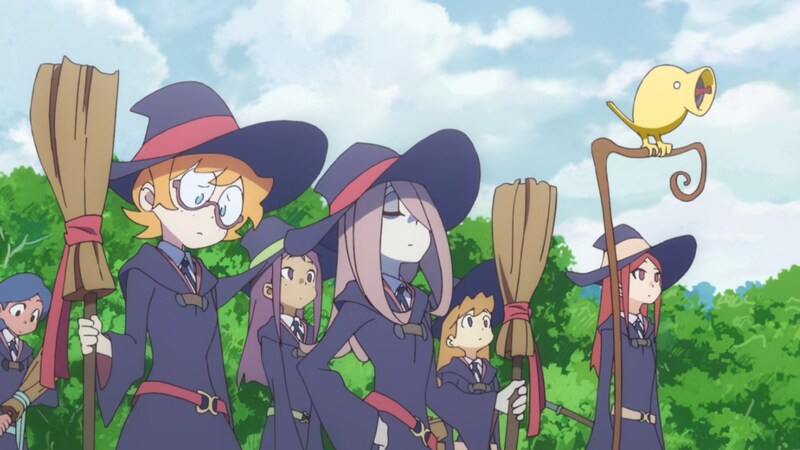 Is it bad that this is up there as one of my favorite episodes of anime in the past year or two? There’s very little substance, but everything came together to create an amazingly fun experience. 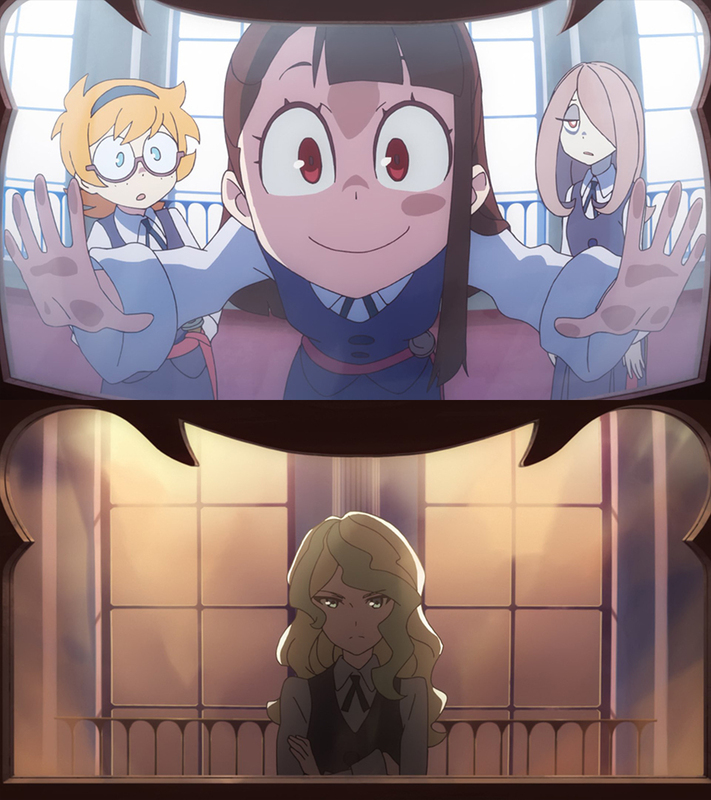 I somehow think LWA TV is surpassing my already high expectations. 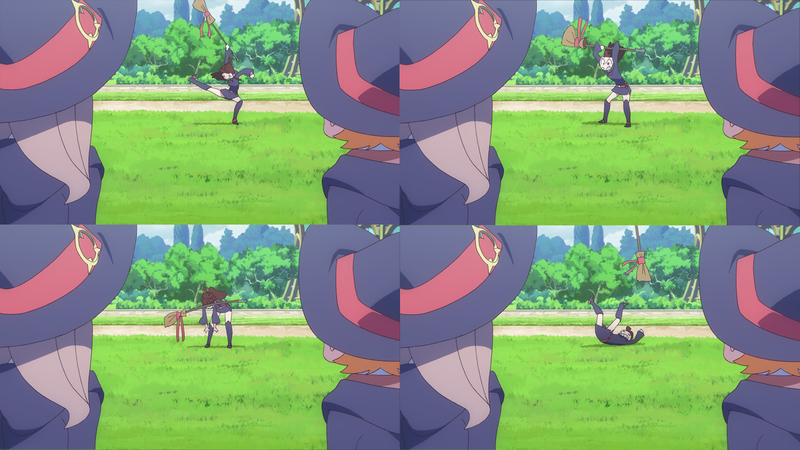 Hopefully Trigger can keep this level of production up somehow. I’m surprised Masayuki hasn’t solo directed a TV series or movie himself. At this point almost everybody who is either a director or assistant director, at Khara, is helming/helmed something. No, he left LWA (but we’re still getting an episode storyboarded by him).